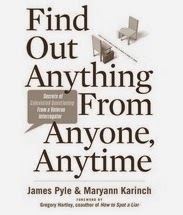 I recently picked up a copy of Find Out Anything From Anyone, Anytime: Secrets of Calculated Questioning From a Veteran Interrogator by James Pyle and Maryann Karinch. That's quite a promise there, James, but can you deliver? Well, let's start out by looking at what this book is, and what it isn't. What it isn't is a comprehensive framework for conducting investigative interviews. In fact, it's not even aimed at professional investigators at all. Perhaps it's best to think of it as one of those self-improvement titles you'll probably see business types reading on the plane, hoping they'll get an edge over the competition. However, what it is is a primer's guide to asking questions. Not just any questions, naturally, but the right questions to elicit the desired information. Unfortunately, the relevant content is padded out with wordy examples, and plenty of personal anecdotes from the author. It's not written in a technical manner, rather, it's quite informal. You might prefer that, I don't. I think that my main criticism is that in order to get to the 'good bits' you really have to sift through the many extraneous layers. And there are good bits! Short, simple questions tend to yield the clearest answers. The way to keep them short and simple is to follow the next rule: Ask about only one thing at a time. This probably could have been disclosed earlier than in Chapter 2 though. Anyway, it's a relatively inexpensive purchase so won't be breaking too many banks. However, keep in mind that this is a better companion to accompany other books on interviewing rather than a stand-alone manual. Focus on questions. That's what I want to hear about. The price. The cost of a standard paperback. Verbiage. The anecdotes and examples detract too much from the core information of interest. Informal writing style. I know that this is intended for a non-investigatory audience and the writing style reflects this, but it wasn't my cup of tea. I think somewhere between a C+ to B- is a fair grade.